a Japanese computer scientiest, research staff member at IBM Ireland, and before assistant professor at Future University Hakodate. His research interests covers artificial intelligence, graph theory, distributed computing and parallel search. Along with Yasushi Tanase, and at times Ayumu Nagai and Norifumi Gotoh, Akihiro Kishimoto is author of the Shogi program ISshogi, and is further author of the Go playing program Akebono (9x9). 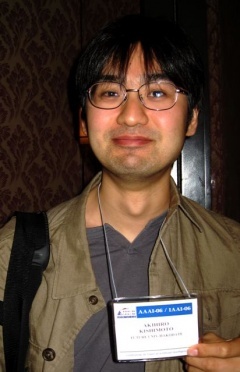 Akihiro Kishimoto was a member of the GAMES group  in the Department of Computing Science at the University of Alberta, and worked with Jonathan Schaeffer et al. on solving Checkers . Additionally, he worked with Martin Müller on graph history interaction, proof-number search and computer Go. This page was last edited on 7 March 2019, at 20:46.